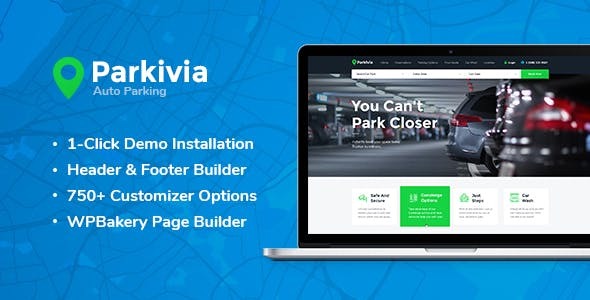 Parkivia is a powerful Parking and Automotive WordPress Theme with a high-class design for car parking, car mechanics and car workshops. The theme can be used for car repair shop, car maintenance service, auto mechanic, bodyshop, collision center, car wash services, garage, workshop, auto blog, and other websites related to vehicle maintenance and car services. The theme is also great for wheels & tires shop, auto care, auto painting, auto tuning, body shop, car care center, car show store. Parkivia has an attractive layout that will perfectly fit for your car wash business. The theme is totally responsive and SEO-ready has One Click demo data installation and is compatible with cool premium plugins: Revolution Slider, Essential Grid, and WPBakery Page Builder. So be sure, all these awesome features will let you have powerful and easy operated auto service website. The theme is compatible with Mapplic Plugin.